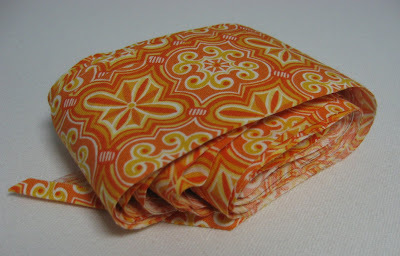 Quite a while ago, I discovered this online fabric shop called 1Choice4Quilting where I found a Moda item I had never seen before. 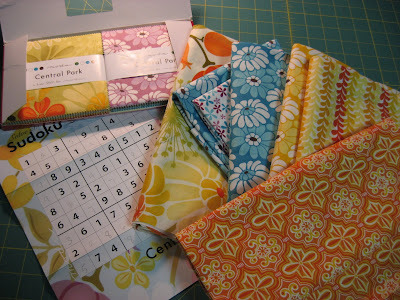 It was a Sudoku Quilt Kit and it was, at the time, available in two different fabric lines. It also happened to be on sale. Being the bargain shopper that I am, and also being in total love with Kate Spain's Central Park fabric line and a fan of sudoku puzzles, I purchased the Central Park Sudoku Quilt Kit. Isn't that the cutest little package? It's only about a half inch thick and just big enough to fit two charm packs, so five inches by ten inches. 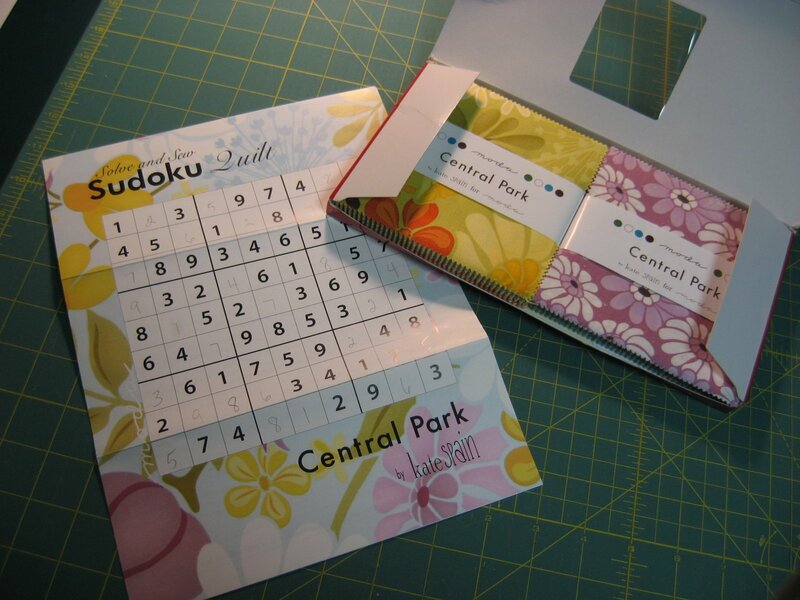 As part of the instructions, there was a sudoku puzzle on the front that had to be completed before the sewing could begin. I did that right away, and then put the little package away...until just a few days ago. 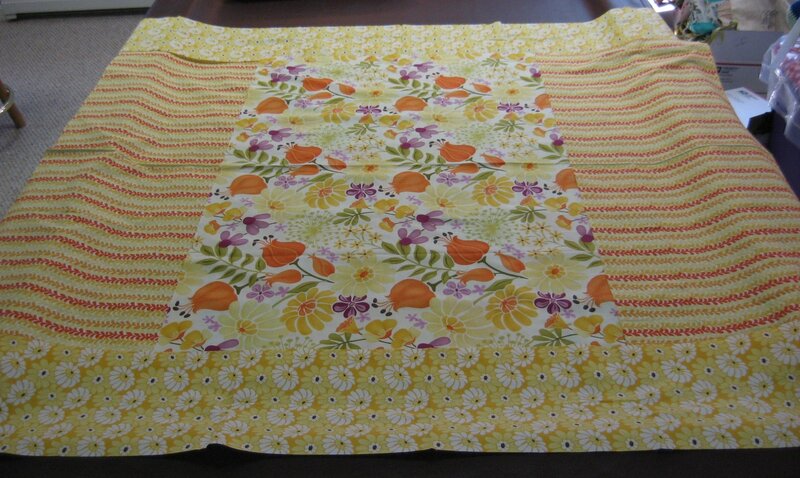 I really had intended to finish binding the last of the four quilts I recently long armed, but my bobbin was full of white thread, and I needed natural to do the last stitching of the binding, so I decided I should just use up the white thread on something else. How's that for justifying starting a new project before finishing another? So I took out that cute little package once again, and the cuts of Central Park I had been collecting from great sales here and there. Ooooh, I was in love all over again! Time to see what was in those two lovely little charm packs in that cute little box. Nine charms each of nine different fabrics in the line. And as it turned out, I actually got one extra of that orange up on the top row! I tossed that into my pile of swap charms! 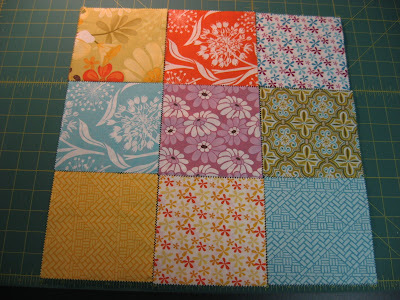 ...and got to work piecing the 9-patch blocks according to the puzzle I had completed. 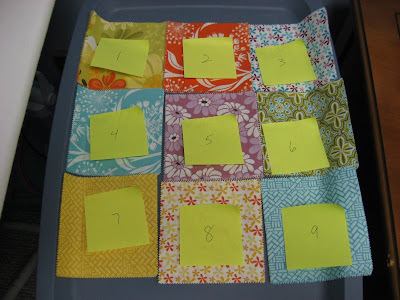 I checked and double checked the placement of each charm as I sewed the blocks, then pinned a sticky note to each finished block, numbering them one through nine. All that was in the instructions! 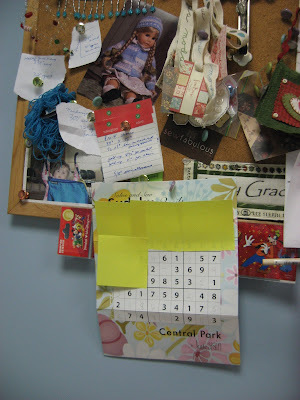 To help keep track of the blocks, I pinned the puzzle on my bulletin board which hangs just over my sewing machine, and used sticky notes to cover each block as I finished it. Then I laid all the blocks out in order and double checked again. 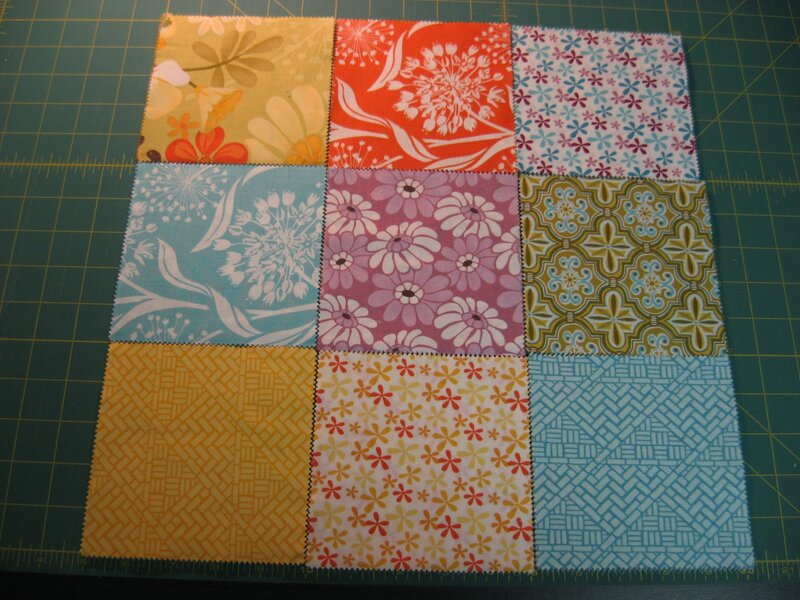 My kids did some checking for me too, just to make sure there was only one of each fabric in each block, row and column. ...and then I pieced the backing. Isn't that center panel just glorious? I really wished I could have gotten more of that fabric! And I made the binding. So now my bobbin is full of natural color thread and I'm ready to finish that last quilt! But at least now I have another one all ready for the long arm again! I feel obliged to keep this addictive cycle going! 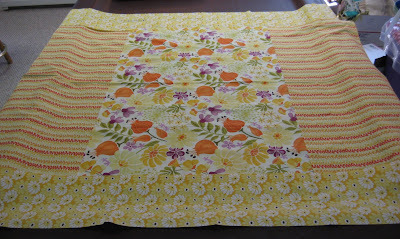 Pictures of the finished fourth quilt coming soon...really! 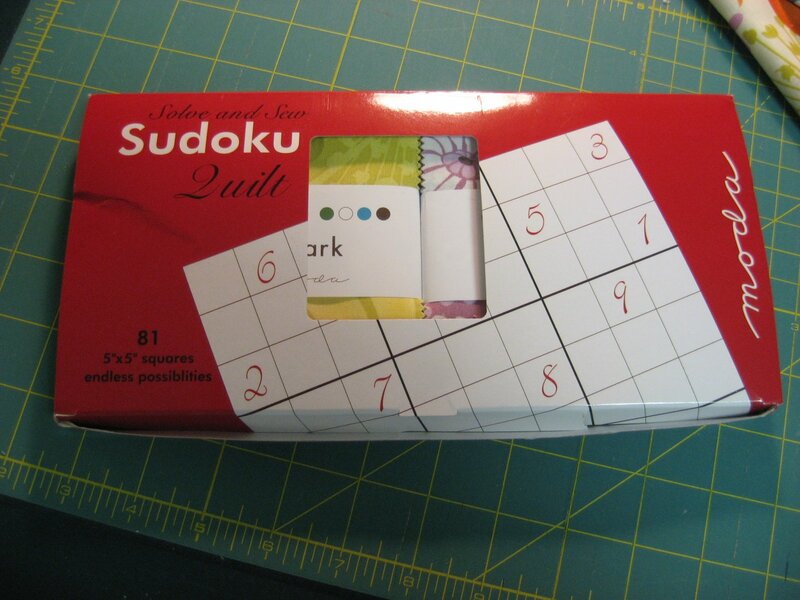 What fun - I love sudoku puzzles - helps keep your brain sharp (at least I hope it will)! 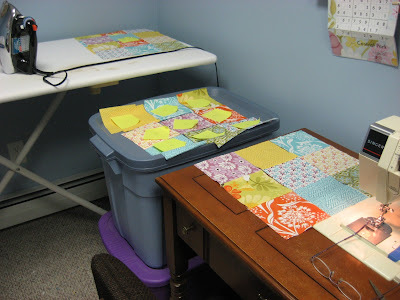 This is an awesome quilt -love it. I don't do sudoko puzzles at all, my brain is much too lazy, but I do sometimes enjoy crossword puzzles. 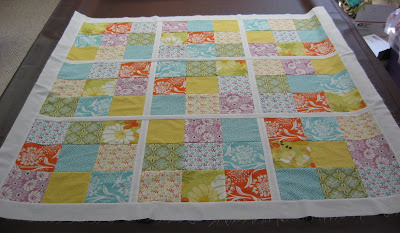 However, your quilt is still pretty, and isn't it nice to have the kids help?